The, suitably, psychedelic artwork on the Italian 2 Foglio poster for the Beatles' classic. Sure to brighten up any space in which it hangs. Actual poster size 39 1/4 x 55 1/4 inches. Some extra creasing and some wear on cross folds, and very little paper loss on bottom cross fold. For further details or information on backing or framing of this poster please see our website Orson & Welles. 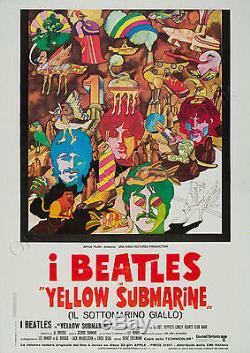 The item "Original Yellow Submarine 1968, Italian 2 Foglio, Film/Movie Poster" is in sale since Wednesday, April 23, 2014. This item is in the category "DVDs, Films & TV\Film Memorabilia\Posters\Originals - UK Quads\1970s".